Super Slab, originally called Not So Super Slab by the old school Sonoma County rock climbing pioneer Mark Howe, is a roadside attraction that should not be missed. 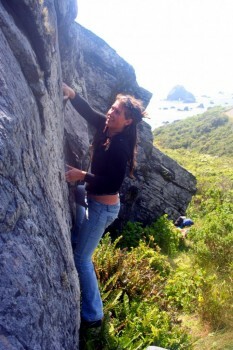 Back when Mark found the place in the 1980s, rock climbing was still new to the Sonoma Coast. That’s probably why he only did the obvious 5.6 slabs and then went on to the bigger rocks up north. For years he told a couple of buddies and myself about it but we never bothered checking it out. One fine day my old friend Shawn Rogers and I were on our way home from our first trip to the newly-discovered Fort Ross Boulders. We both thought, “Damn, if that sandstone up on the North Coast (that we used to think was too crumbly) is actually that good, then maybe we should check out this ‘Not So Super Slab’ place on our way home. What if it’s actually super?” So we pulled off the highway into the big turnout right below the crag and bushwhacked our way up toward the small outcrop. We were psyched to find just what we were looking for: hidden behind layers of thick shrubbery were some great looking boulder problems. After a little landscaping to clear out the base of the boulder and to make a good trail, we soon had about five to ten new classics. It wouldn’t take long before we had dropped the “Not So” from the old name and started respectfully calling the place Super Slab. Which SuperTopo guidebooks cover Super Slab? Liz Larson climbs The Virgin (V0).